LARGE dispensers - For rolls up to 300 mm diameter. SMALL dispensers - For rolls of 120mm diameter. WIDE dispensers - at 280mm wide for multi-roll use. NARROW dispensers - 30mm wide for single rolls. LABELpeel have been manufacturing manual label dispensers for a number of years, providing a very useful answer to many labelling needs. Our products being used by industry and commerce in packaging, product identification, bar-coding, quality control, distribution and many, many other uses. All products are made-to-order, but time has dictated certain sizes are in regular demand so these have become our standard products and therefore we keep stocks of made components ready for these. DIVIDERS are fitted as standard to our multi-roll dispensers but we can also now fit them to our MBB200(P) dispenser. SMALL DISPENSERS - for rolls of only 120mm in diameter. 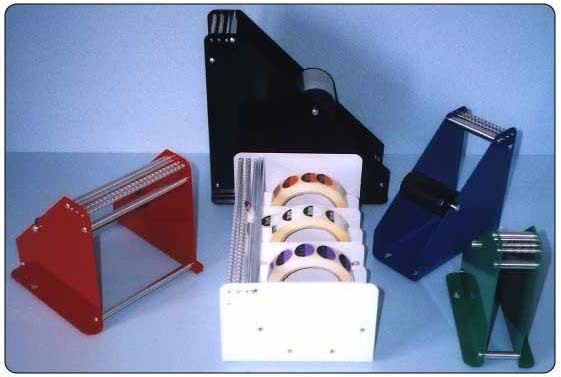 NARROW DISPENSERS - of 30mm wide for single rolls of small labels. DO YOU HAVE LABELS WHICH ARE DIFFICULT TO DISPENSE?